KLOO® is an award winning card game that makes learning a language fun for both children and adults alike. Suitable for use by total beginners as well as improvers, KLOO® uses a unique colour-coding system to enable the players to build sentences. Within seconds children start learning words and making grammatically correct sentences. 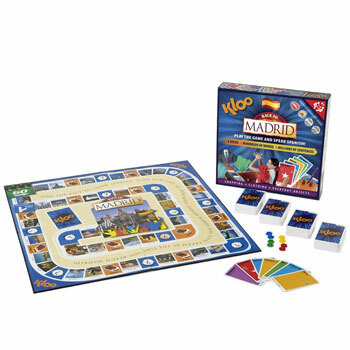 The longer the sentence and the more words you learn, the faster you can power your cars around the special "Race to Madrid" game board. Compete, race and overtake! Using coloured cars to keep score, players speed through the great cities of Spain in a race to the capital. The game board shows genuine pictures of cultural sites and places of interest in each city. Extra, optional game board rules spice up the fun. The four decks of KLOO® cards contain useful Spanish words for making sentences. Once players know all the words in one deck, they move on to the next one. In a short time players learn to make thousands of Spanish sentences. KLOO® was designed by a games expert, tested by teachers and is enjoyed by families around the world. It has won for a raft of awards and plaudits for making language learning fun and effective. It is a card system rather than a single game which means that instead of playing just one game, you can play up to 16 different games, keeping your learning interesting and fresh. Some games are fast and simple and designed for kids, others are more challenging and better suited to adults. KLOO® Spanish - Race to Madrid includes a game board set plus 4 decks of KLOO® cards. As players learn all the words in one deck, they move onto the next, building their vocabulary as they go. KLOO® is produced by a British company and uses Castilian (European) Spanish.